"Silkworm" redirects here. For Chinese anti-ship missile, see Silkworm (missile). "Silk moth" redirects here. For Giant silk moth, see Saturniinae. The silkworm is the larva or caterpillar of the domestic silkmoth, Bombyx mori (Latin: "silkworm of the mulberry tree"). It is an economically important insect, being a primary producer of silk. A silkworm's preferred food is white mulberry leaves, though they may eat other mulberry species and even osage orange. Domestic silkmoths are closely dependent on humans for reproduction, as a result of millennia of selective breeding. Wild silkmoths are different from their domestic cousins as they have not been selectively bred; they are not as commercially viable in the production of silk. Sericulture, the practice of breeding silkworms for the production of raw silk, has been under way for at least 5,000 years in China, whence it spread to India, Korea, Japan, and the West. The silkworm was domesticated from the wild silkmoth Bombyx mandarina, which has a range from northern India to northern China, Korea, Japan, and the far eastern regions of Russia. The domesticated silkworm derives from Chinese rather than Japanese or Korean stock. Domestic silkmoths are very different from most members in the genus Bombyx; not only have they lost the ability to fly, but their color pigments are also lost. Mulberry silkworms can be categorized into three different but connected groups or types. The major groups of silkworms fall under the univoltine ("uni-"=one, "voltine"=brood frequency) and bivoltine categories. The univoltine breed is generally linked with the geographical area within greater Europe. The eggs of this type hibernate during winter due to the cold climate, and cross-fertilize only by spring, generating silk only once annually. The second type is called bivoltine and is normally found in China, Japan, and Korea. The breeding process of this type takes place twice annually, a feat made possible through the slightly warmer climates and the resulting two life cycles. The polyvoltine type of mulberry silkworm can only be found in the tropics. The eggs are laid by female moths and hatch within nine to 12 days, so the resulting type can have up to eight separate life cycles throughout the year. Eggs take about 14 days to hatch into larvae, which eat continuously. They have a preference for white mulberry, having an attraction to the mulberry odorant cis-jasmone. They are not monophagous since they can eat other species of Morus, as well as some other Moraceae, mostly Osage orange. They are covered with tiny black hairs. When the color of their heads turns darker, it indicates they are about to molt. 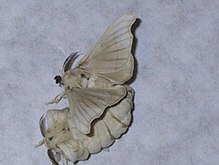 After molting, the larval phase of the silkworms emerge white, naked, and with little horns on their backs. After they have molted four times, their bodies become slightly yellow and the skin becomes tighter. The larvae then prepare to enter the pupal phase of their lifecycle, and enclose themselves in a cocoon made up of raw silk produced by the salivary glands. The final molt from larva to pupa takes place within the cocoon, which provides a vital layer of protection during the vulnerable, almost motionless pupal state. Many other Lepidoptera produce cocoons, but only a few—the Bombycidae, in particular the genus Bombyx, and the Saturniidae, in particular the genus Antheraea—have been exploited for fabric production. If the animal is allowed to survive after spinning its cocoon and through the pupal phase of its lifecycle, it releases proteolytic enzymes to make a hole in the cocoon so it can emerge as an adult moth. These enzymes are destructive to the silk and can cause the silk fibers to break down from over a mile in length to segments of random length, which seriously reduces the value of the silk threads, but not silk cocoons used as "stuffing" available in China and elsewhere for doonas, jackets etc. To prevent this, silkworm cocoons are boiled. The heat kills the silkworms and the water makes the cocoons easier to unravel. Often, the silkworm itself is eaten. As the process of harvesting the silk from the cocoon kills the larva, sericulture has been criticized by animal welfare and rights activists. Mahatma Gandhi was critical of silk production based on the Ahimsa philosophy "not to hurt any living thing". This led to Gandhi's promotion of cotton spinning machines, an example of which can be seen at the Gandhi Institute. He also promoted Ahimsa silk, wild silk made from the cocoons of wild and semiwild silkmoths. The moth – the adult phase of the lifecycle – is not capable of functional flight, in contrast to the wild B. mandarina and other Bombyx species, whose males fly to meet females and for evasion from predators. Some may emerge with the ability to lift off and stay airborne, but sustained flight cannot be achieved. This is because their bodies are too big and heavy for their small wings. However, some silkmoths can still fly. Silkmoths have a wingspan of 3–5 cm (1.2–2.0 in) and a white, hairy body. Females are about two to three times bulkier than males (for they are carrying many eggs), but are similarly colored. Adult Bombycidae have reduced mouth parts and do not feed, though a human caretaker can feed them. The cocoon is made of a thread of raw silk from 300 to about 900 m (1,000 to 3,000 ft) long. The fibers are very fine and lustrous, about 10 μm (0.0004 in) in diameter. 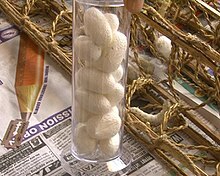 About 2,000 to 3,000 cocoons are required to make a pound of silk (0.4 kg). At least 70 million pounds of raw silk are produced each year, requiring nearly 10 billion cocoons. 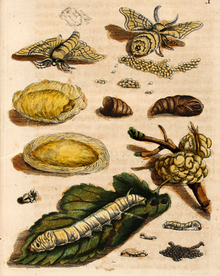 1679 study of the silkworm metamorphosis by Maria Sibylla Merian, it depicts the fruit and leave of a mulberry tree and the eggs and larvae of the silkworm moth. Due to its small size and ease of culture, the silkworm has become a model organism in the study of lepidopteran and arthropod biology. Fundamental findings on pheromones, hormones, brain structures, and physiology have been made with the silkworm. One example of this was the molecular identification of the first known pheromone, bombykol, which required extracts from 500,000 individuals, due to the very small quantities of pheromone produced by any individual worm. Currently, research is focusing on genetics of silkworms and the possibility of genetic engineering. Many hundreds of strains are maintained, and over 400 Mendelian mutations have been described. Another source suggests 1,000 inbred domesticated strains are kept worldwide. One useful development for the silk industry is silkworms that can feed on food other than mulberry leaves, including an artificial diet. Research on the genome also raises the possibility of genetically engineering silkworms to produce proteins, including pharmacological drugs, in the place of silk proteins. Bombyx mori females are also one of the few organisms with homologous chromosomes held together only by the synaptonemal complex (and not crossovers) during meiosis. Kraig Biocraft Laboratories has used research from the Universities of Wyoming and Notre Dame in a collaborative effort to create a silkworm that is genetically altered to produce spider silk. In September 2010, the effort was announced as successful. Researchers at Tufts developed scaffolds made of spongy silk that feel and look similar to human tissue. They are implanted during reconstructive surgery to support or restructure damaged ligaments, tendons, and other tissue. They also created implants made of silk and drug compounds which can be implanted under the skin for steady and gradual time release of medications. Researchers at the MIT Media Lab experimented with silkworms to see what they would weave when left on surfaces with different curvatures. They found that on particularly straight webs of lines, the worms would connect neighboring lines with silk, weaving directly onto the given shape. Using this knowledge they built a silk pavilion with 6,500 silkworms over a number of days. Silkworms have been used in antibiotics discovery as they have several advantageous traits compared to other invertebrate models. Antibiotics such as lysocin E, a non-ribosomal peptide synthesized by Lysobacter sp. RH2180-5 and GPI0363 are among the notable antibiotics discovered using silkworms. As of January 2, 2019, China's Chang'e-4 lander brought silkworms to the moon. A small microcosm 'tin' in the lander contained A. thaliana, seeds of potatoes, as well as silkworm eggs. As plants would support the silkworms with oxygen, and the silkworms would in turn provide the plants with necessary carbon dioxide and nutrients through their waste, researchers will evaluate whether plants successfully perform photosynthesis, and grow and bloom in the lunar environment. The domesticated form, compared to the wild form, has increased cocoon size, body size, growth rate, and efficiency of its digestion. It has gained tolerance to human presence and handling, and also to living in crowded conditions. The domesticated moth cannot fly, so it needs human assistance in finding a mate, and it lacks fear of potential predators. The native color pigments are also lost, so the domesticated moths are leucistic since camouflage isn't useful when they only live in captivity. These changes have made the domesticated strains entirely dependent upon humans for survival. The eggs are kept in incubators to aid in their hatching. Silkworms were first domesticated in China over 5,000 years ago. Since then, the silk production capacity of the species has increased nearly tenfold. The silkworm is one of the few organisms wherein the principles of genetics and breeding were applied to harvest maximum output. It is second only to maize in exploiting the principles of heterosis and cross breeding. Silkworm breeding is aimed at the overall improvement of silkworm from a commercial point of view. The major objectives are improving fecundity (the egg-laying capacity of a breed), the health of larvae, quantity of cocoon and silk production, and disease resistance. Healthy larvae lead to a healthy cocoon crop. Health is dependent on factors such as better pupation rate, fewer dead larvae in the mountage, shorter larval duration (shorter larval duration lessens the chance of infection) and bluish-tinged fifth-instar larvae (which are healthier than the reddish-brown ones). Quantity of cocoon and silk produced are directly related to the pupation rate and larval weight. Healthier larvae have greater pupation rates and cocoon weights. Quality of cocoon and silk depends on a number of factors including genetics. In the US, teachers may sometimes introduce the insect life cycle to their students by raising silkworms in the classroom as a science project. Students have a chance to observe complete life cycles of insect from egg stage to larvae, pupa, moth. 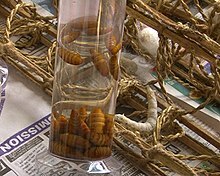 The silkworm has been raised as a hobby in countries such as China, South Africa, Zimbabwe, and Iran. Children often pass on the eggs, creating a non-commercial population. The experience provides children with the opportunity to witness the life cycle of silkworms. The practice of raising silkworms by children as pets has, in non-silk farming South Africa, led to the development of extremely hardy landraces of silkworms, because they are invariably subjected to hardships not encountered by commercially farmed members of the species. However, these worms, not being selectively bred as such, are possibly inferior in silk production and may exhibit other undesirable traits. The full genome of the silkworm was published in 2008 by the International Silkworm Genome Consortium. Draft sequences were published in 2004. The genome of the silkworm is mid-range with a genome size around 432 megabase pairs. High genetic variability has been found in domestic lines of silkworms, though this is less than that among wild silkmoths (about 83 percent of wild genetic variation). This suggests a single event of domestication, and that it happened over a short period of time, with a large number of wild worms having been collected for domestication. Major questions, however, remain unanswered: "Whether this event was in a single location or in a short period of time in several locations cannot be deciphered from the data". Research also has yet to identify the area in China where domestication arose. 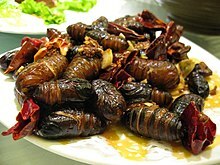 Silkworm pupae are eaten in some cultures. In Assam, they are boiled for extracting silk and the boiled pupae are eaten directly with salt or fried with chilli pepper or herbs as a snack or dish. In Korea, they are boiled and seasoned to make a popular snack food known as beondegi (번데기). In China, street vendors sell roasted silkworm pupae. In Japan, silkworms are usually served as a tsukudani (佃煮), i.e., boiled in a sweet-sour sauce made with soy sauce and sugar. In Vietnam, this is known as con nhộng. In Thailand, roasted silkworm is often sold at open markets. They are also sold as packaged snacks. Silkworms have also been proposed for cultivation by astronauts as space food on long-term missions. 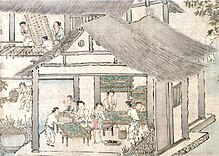 In China, a legend indicates the discovery of the silkworm's silk was by an ancient empress Lei Zu, the wife of the Yellow Emperor and the daughter of XiLing-Shi. She was drinking tea under a tree when a silk cocoon fell into her tea. As she picked it out and started to wrap the silk thread around her finger, she slowly felt a warm sensation. When the silk ran out, she saw a small larva. In an instant, she realized this caterpillar larva was the source of the silk. She taught this to the people and it became widespread. Many more legends about the silkworm are told. 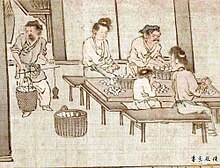 The Chinese guarded their knowledge of silk, but, according to one story, a Chinese princess given in marriage to a Khotan prince brought to the oasis the secret of silk manufacture, "hiding silkworms in her hair as part of her dowry", probably in the first half of the first century AD. About AD 550, Christian monks are said to have smuggled silkworms, in a hollow stick, out of China and sold the secret to the Byzantine Empire. Beauveria bassiana, a fungus, destroys the entire silkworm body. This fungus usually appears when silkworms are raised under cold conditions with high humidity. This disease is not passed on to the eggs from moths, as the infected silkworms cannot survive to the moth stage. This fungus can spread to other insects. Grasserie, also known as nuclear polyhedrosis, milky disease, or hanging disease, is caused by infection with the Bombyx mori nuclear polyhedrosis virus. If grasserie is observed in the chawkie stage, then the chawkie larvae must have been infected while hatching or during chawkie rearing. Infected eggs can be disinfected by cleaning their surfaces prior to hatching. Infections can occur as a result of improper hygiene in the chawkie rearing house. This disease develops faster in early instar rearing. Pébrine is a disease caused by a parasitic microsporidian, N. bombycis. Diseased larvae show slow growth, undersized, pale and flaccid bodies, and poor appetite. Tiny black spots appear on larval integument. Additionally, dead larvae remain rubbery and do not undergo putrefaction after death. N. bombycis kills 100% of silkworms hatched from infected eggs. This disease can be carried over from worms to moths, then eggs and worms again. This microsporidium comes from the food the silkworms eat. Mother moths pass the disease to the eggs, and 100% of worms hatching from the diseased eggs will die in their worm stage. To prevent this disease, it is extremely important to rule out all eggs from infected moths by checking the moth's body fluid under a microscope. Flacherie infected silkworms look weak and are colored dark brown before they die. The disease destroys the larva's gut and is caused by viruses or poisonous food. Several diseases caused by a variety of funguses are collectively named Muscardine. In traditional Chinese medicine, silkworm is the source of the "stiff silkworm", which is made from dried fourth- or fifth-instar larvae which have died of "white muscardine disease", the Beauveria bassiana fungal infection mentioned above. It is believed to dispel flatulence, dissolve phlegm, and relieve spasms. Grimaldi, David A.; Engel, Michael S. (2005). Evolution of the Insects. Cambridge University Press. ISBN 978-0-521-82149-0. Johnson, Sylvia (1989). Silkworms. Lerner Publications. ISBN 978-0-8225-9557-1. Children's book with lots of photos. Scoble, M. J. (1995). The Lepidoptera: Form, Function and Diversity. Princeton University Press. ISBN 978-0-19-854952-9. Yoshitake, N. (1968). "Phylogenetic aspects on the origin of Japanese race of the silkworm, Bombyx mori L.". Journal of Sericological Sciences of Japan. 37: 83–87. Trevisan, Adrian. "Cocoon Silk: A Natural Silk Architecture". Sense of Nature. Archived from the original on 7 May 2012. Wolchover, Natalie. "The Silk Renaissance". Seed Magazine. ^ E. J. W. Barber (1992). Prehistoric Textiles: the Development of Cloth in the Neolithic and Bronze Ages with Special Reference to the Aegean. Princeton University Press. p. 31. ISBN 978-0-691-00224-8. ^ K. P. Arunkumar; Muralidhar Metta; J. Nagaraju (2006). "Molecular phylogeny of silkmoths reveals the origin of domesticated silkmoth, Bombyx mori from Chinese Bombyx mandarina and paternal inheritance of Antheraea proylei mitochondrial DNA" (PDF). Molecular Phylogenetics and Evolution. 40 (2): 419–427. doi:10.1016/j.ympev.2006.02.023. PMID 16644243. ^ Hideaki Maekawa; Naoko Takada; Kenichi Mikitani; Teru Ogura; Naoko Miyajima; Haruhiko Fujiwara; Masahiko Kobayashi; Osamu Ninaki (1988). "Nucleolus organizers in the wild silkworm Bombyx mandarina and the domesticated silkworm B. mori" (PDF). Chromosoma. 96 (4): 263–269. doi:10.1007/BF00286912. ^ Brian K. Hall (2010). Evolution: Principles and Processes. Topics in Biology. Jones & Bartlett Learning. p. 400. ISBN 978-0-7637-6039-7. ^ Trevisan, Adrian. "Cocoon Silk: A Natural Silk Architecture". Sense of Nature. Archived from the original on 7 May 2012. ^ a b Goldsmith, Marian R.; Shimada, Toru; Abe, Hiroaki (2005). "The genetics and genomics of the silkworm, Bombyx mori". Annual Review of Entomology. 50 (1): 71–100. doi:10.1146/annurev.ento.50.071803.130456. PMID 15355234. ^ a b The International Silkworm Genome Consortium (2008). "The genome of a lepidopteran model insect, the silkworm Bombyx mori". Insect Biochemistry and Molecular Biology. 38 (12): 1036–1045. doi:10.1016/j.ibmb.2008.11.004. PMID 19121390. ^ Gerton and Hawley (2005). "Homologous Chromosome Interactions in Meiosis: Diversity Amidst Conservation". Nature Reviews Genetics. 6 (6): 477–487. doi:10.1038/nrg1614. PMID 15931171. ^ "University of Notre Dame". ^ Hamamoto, H., Urai, M., Ishii, K., Yasukawa, J., Paudel, A., Murai, M., Kaji, T., Kuranaga, T., Hamase, K., Katsu, T., Su, J., Adachi, T., Uchida, R., Tomoda, H., Yamada, M., Souma, M., Kurihara, H., Inoue, M., and Sekimizu, K. (2015). Lysocin E is a new antibiotic that targets menaquinone in the bacterial membrane. Nat. Chem. Biol. 11, 127-133 PMID 25485686 DOI: 10.1038/nchembio.1710. ^ Panthee, S., Hamamoto, H., Suzuki, Y., and Sekimizu, K. (2017). In silico identification of lysocin biosynthetic gene cluster from Lysobacter sp. RH2180-5. J. Antibiot. 70, 204-207 PMID 27553855 DOI: 10.1038/ja.2016.102. ^ Paudel, A., Hamamoto, H., Panthee, S., Kaneko, K., Matsunaga, S., Kanai, M., Suzuki, Y., and Sekimizu, K. (2017). A novel spiro-heterocyclic compound identified by the silkworm infection model inhibits transcription in Staphylococcus aureus. Front Microbiol 8, 712 PMID 28487682 DOI: 10.3389/fmicb.2017.00712. ^ a b Letzter, Rafi (4 January 2019). "There Are Plants and Animals on the Moon Now (Because of China)". Space.com. Retrieved 15 January 2019. ^ Connor, Neil (13 April 2018). "China plans to grow flowers and silkworms on the dark side of the moon". The Telegraph. ISSN 0307-1235. Retrieved 15 January 2019. ^ Marian R. Goldsmith; Toru Shimada; Hiroaki Abe (2005). "The genetics and genomics of the silkworm, Bombyx mori". Annual Review of Entomology. 50: 71–100. doi:10.1146/annurev.ento.50.071803.130456. PMID 15355234. ^ Hong-Song Yu1; Yi-Hong Shen; Gang-Xiang Yuan; et al. (2011). "Evidence of selection at melanin synthesis pathway loci during silkworm domestication". Molecular Biology and Evolution. 28 (6): 1785–99. doi:10.1093/molbev/msr002. PMID 21212153. ^ Dennis Normile (2009). "Sequencing 40 Silkworm Genomes Unravels History of Cultivation". Science. 325 (5944): 1058–1059. Bibcode:2009Sci...325.1058N. doi:10.1126/science.325_1058a. PMID 19713499. ^ "Mountage: Meaning and Types | Sericulture". Zoology Notes. 21 July 2016. ^ "Silkworm School Science Project Instruction" (PDF). Archived from the original (PDF) on 14 March 2012. Retrieved 18 October 2011. ^ Kazuei Mita; Masahiro Kasahara; Shin Sasaki; et al. (2004). "The genome sequence of silkworm, Bombyx mori". DNA Research. 11 (1): 27–35. doi:10.1093/dnares/11.1.27. PMID 15141943. ^ Xia Q; Zhou Z; Lu C; et al. (2004). "A draft sequence for the genome of the domesticated silkworm (Bombyx mori)". Science. 306 (5703): 1937–40. Bibcode:2004Sci...306.1937X. doi:10.1126/science.1102210. PMID 15591204. ^ "10 Weird Foods in India - Eri polu". February 2013. ^ Choi, Charles Q. (13 January 2009). "Care for a Silkworm With Your Tang?". ScienceNOW Daily News. Archived from the original on 25 February 2011. Retrieved 14 January 2009. ^ Sarah Underhill Wisseman, Wendell S. Williams. Ancient Technologies and Archaeological Materials . Routledge, 1994. ISBN 2-88124-632-X. Page 131. Kelly, Henrietta Aiken (1903). The culture of the mulberry silkworm. Washington DC: U.S. Department of Agriculture, Government Printing Office. Retrieved 17 January 2012. Wikimedia Commons has media related to Bombyx mori. This page was last edited on 5 April 2019, at 01:47 (UTC).